[Conference] 6 - 7 July 2012, Nottingham Institute for Research in Visual Culture, and the Urban Culture Network at the University of Nottingham. 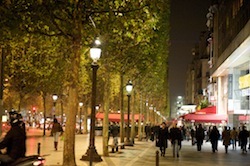 The flâneur – the leisurely but vigilant urban stroller – is well-known as a quintessential nineteenth-century Parisian archetype, and has attracted a distiguished array of champions and historians – from Balzac and Baudelaire to Walter Benjamin. However, although recent writing on the subject (The Flâneur, ed. Keith Tester, and The Invisible Flâneuse. Gender, Public Space, and Visual Culture in Nineteenth-Century Paris (2006), ed. Tom MacDonough & Aruna D’Souza) have certainly been eclectic in their scope, there has been little sustained attention given to the adaptation of the phenomenon outside Paris, let alone outside France and indeed Europe, whether in the form of modern sequels, contemporary echoes, as well as historic antecedents. The flâneur as self-contained but all-seeing city-dweller has been seen as an icon of modernity, tyrant of the empowered male gaze, and anguished urbanite in retreat from the inhospitable environment of the city and its threatening crowds. Within Paris its meanings evolved from early nineteenth-century versions, including alienated consumers and voracious voyeurs, to more second-order types of pedestrian observer, as in the case of self-indulgent touristic fantasies. Yet the allure of the flâneur’s persona has led to its translation far beyond Parisian boulevards and arcades. This conference aims to map some of the flâneur’s travels and transpositions. In doing so, it may be possible to clarify how far the flâneur is dependent on Paris as a milieu. And in historical terms, is it in fact a variant form of older, more inclusive patterns of walking, viewing and writing the city? Can we find models and antecedents for pedestrian spectators in earlier ages and locations? When modern flâneurs step out in foreign cities, how much of a Parisian ethos clings to them? How limiting is the flâneur’s gaze and mind set? This might also apply to Parisians (or adopted Parisians) travelling abroad, or francophile pedestrians. – Musical forms of expression which invoke flâneurie, and related forms of living in the city. – Last but not least, variants on or revisions of the stereotype of the flâneur in Paris (at any period). The conference is co-organised by the Nottingham Institute for Research in Visual Culture and Urban Culture Network and University of Nottingham – Arts Centre. Please consult the programme and the booking informations on the website of the event. Illustration : Sirsnapsalot, « Evening Stroll in Paris », 30.10.2009, Flickr, (licence Creative Commons). Traduction et circulation internationale des idées.